Physical activities and active lifestyles are important remain healthy and have a good life quality. The key factor to encourage people to get involved to these activities lies in the fun, excitement and social aspects of the activity. Augmented dodgeball was built to enrich the user experience of a physical game and make it more attractive to all audiences. It is enhancing the physical dodgeball game with computer game elements. By adding virtual life points, attack power and defence power, people with different skill levels can enjoy playing together. Players are able to choose a player role that corresponds to their physical skills and liking. The progress of the game along with the player role information can be seen from the scoreboard throughout the course of the game. By detecting the thrower of the ball and the person who got hit, a sophisticated point system is used to make the game exciting for everyone. 東将大，Tim Schewe，Rebane Kadri，野嶋琢也, Augmented Dodgeballにおけるプレイヤ情報管理および観客向け情報表示,超人スポーツ学術研究会, 2017. 四條 亮太，Kadri Rebane，野嶋 琢也，”球技拡張のためのプレイヤ・ボールインタラクション検出デバイス”，日本バーチャルリアリティ学会大会予稿集, 3F2-06, 2017. Kadri Rebane, Takahiro Kai, Naoki Endo, Tomonari Imai, Takuya Nojima, and Yohei Yanase. 2017. 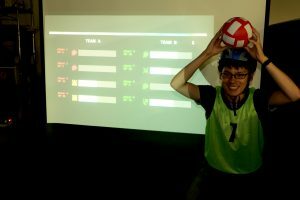 Insights of the augmented dodgeball game design and play test. In Proceedings of the 8th Augmented Human International Conference (AH ’17). ACM, New York, NY, USA, , Article 12 , 10 pages.